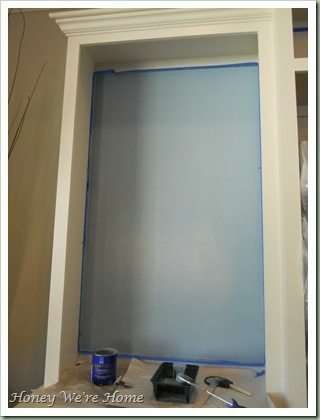 I left the cabinet like this for about a week, then decided to paint the wall behind the television as well. I didn’t paint it initially because the t.v. is too hard to move and I knew I’d only be able to do part of the wall. Then, I realized the t.v. swiveled, making that paint job a bit easier. So, now all of the walls on the media cabinet are painted and it looks more cohesive. I think it turned out pretty well. The blue is really nice in person with just a hint of aqua. It looks more slate and less sugary at home and is even prettier in the evening. 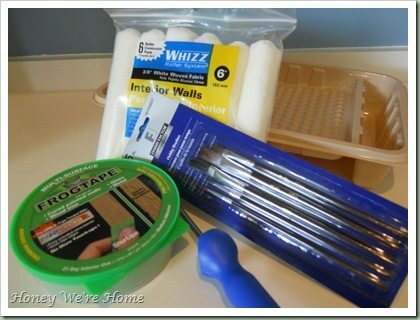 Step 2: Remove shelves and apply tape to avoid getting paint where you don’t want it. 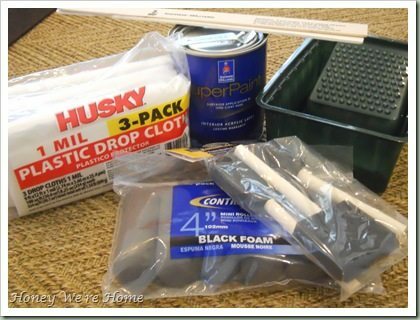 Step 3: Gather supplies (paint, foam rollers and brushes, bucket, drop cloth). 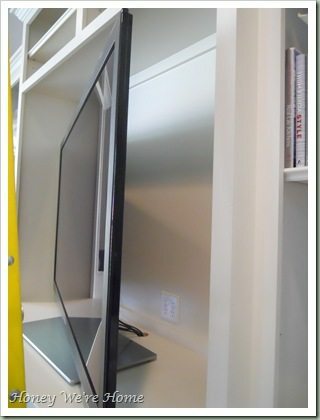 Step 4: Cover ginormous t.v. with drop cloth. 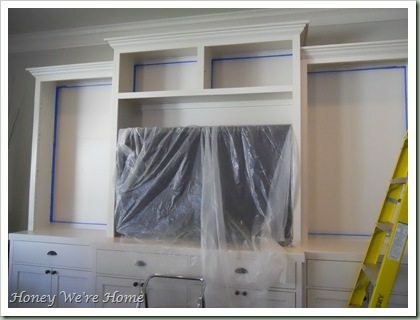 (must.not.get.paint.on.t.v.must.not.get.paint.on.t.v.)! 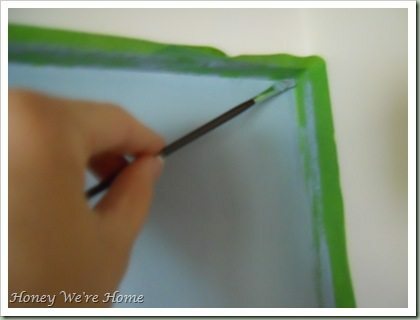 Step 5: Begin painting. First I painted the frame with a foam brush. Step 6: Then I used a foam roller to apply two coats of paint. The cabinet looked like this when I was finished and put the shelves back in. I do have some a lot of “touch up” work to do where the paint is uneven near where I taped. I plan to get a small brush to redo those areas. 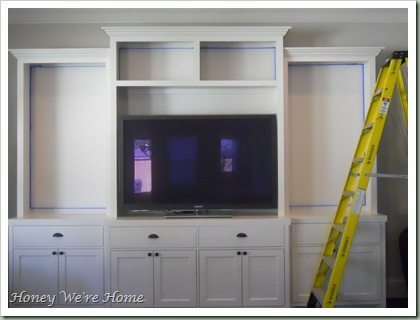 *Update: When I went back and painted the area behind the t.v., I also did those touch-ups, this time using Blue Frog tape instead of blue tape and taking the tape off as soon as I was done painting, while the paint was wet. The results were much better. 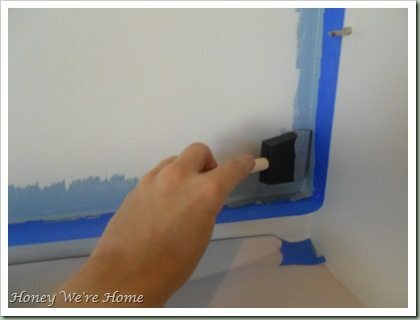 I made sure that the tape was pressed down very hard before painting. Instead of a 4 inch foam roller, I used a 6 inch fabric roller. A small paint brush was used to do the cut ins, instead of the foam brush. When the tape was removed, I had clean, crisp lines. Yay!!!! So much better. I played around with the accessories, using a mix of silver, white and brown. To me, silver, white, and black looked too stark and so the browns added some warmth. I’m still searching for the perfect pictures to put in two of the silver frames. Also, I’m thinking of adding some large books to the shelves above the t.v. I tried removing the upper middle shelf, but it looked a bit odd. I plan to do a post soon on where I found or repurposed all the lovely accessories. It's beautiful! I love how the color turned out and the accessories look amazing. I struggle with accessories on my entertainment center so much that I gave up and just have one picture frame on each shelf. Sad but true. Yes, accessorizing isn't so easy (for me). I seriously was arranging and rearranging all weekend! I even lowered one of the shelves on the left. 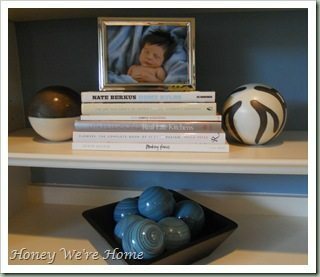 I'm always looking at blogs and magazines for inspiration on how to accessorize bookshelves. Maybe a good future post idea. It looks fantastic! That is the color blue we used in our daughter's bathroom…I love it with her chocolate brown cabinets. I finally posted pictures of the downstairs, you'll have to check it out. I remember to take a full picture of the entertainment center this time. I am forever playing with the arrangements there and in library! The blue background looks soothing and cheerful at the same time – beautiful!! It looks so good!! Love the color! I just had a thought for those frames…I am always searching for the perfect photos for frames, then while at a girlfriend's house I noticed she had bought some pretty scrapbook paper, and applied their monogram to it and framed it. You could do your last name as well. I know how much you LOVE pretty paper! It looks fantastic! Great woork. Thanks for stopping by my blog! 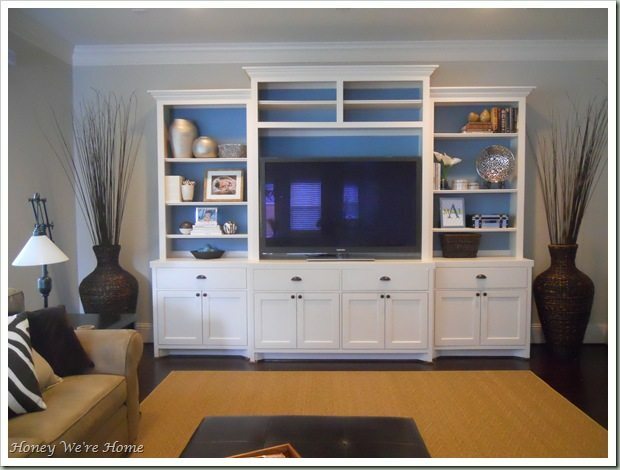 I love the newly painted entertainment center- what a fantastic idea!!! =D It really did turn out beautiful. Jennifer- so true about the name! It can be the tie-breaker for sure. Thanks for visiting me..I appreciated the comment:) And this media cabinet looks wonderful! It looks gorgeous and really makes everything in there pop. Love it! Fabulous makeover. I love the blue background and all the lovely accessories really make it pop now. Thanks for popping over today ! It turned out awesome! The blue is just the punch your LR needed. I wish I had a bookshelf in mine to display all my finds! Jayma15- Yeah, I considered that, but would have to move the whole tv to get the entire wall behind there and I was alone when I painted. May have to add that in the future- you’re right, it would definitely look better with that wall painted too. So my husband just told me that the tv swivels (duh that I didn't know that) and that I should be able to paint that whole middle back wall:) I'm going to try to get to that on Friday or over the weekend. I'll post some new pics after it's done. 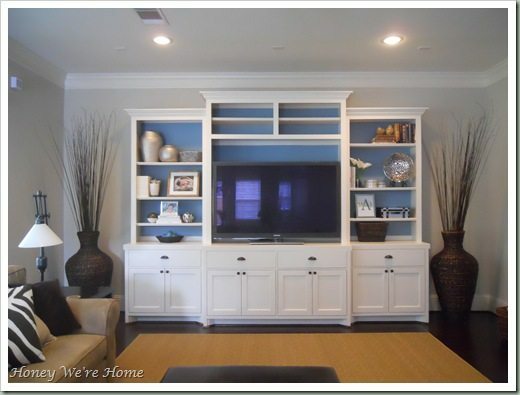 I might be the only one, but I think you need to paint the blue behind the television too…. Sorry if it sounds critical, I'm not trying to be! I like following your blog! I love it. What a gorgeous blue you used. I'm considering doing the same thing to the back of an open cupboard in my newly painted kitchen – can't decide on the colour or if I should use a wallpaper, though. Megan, hope I didn't offend you!! Wow! That blue really makes a big difference! Thanks for linking up to the Mad Skills party! This is gorgeous ! I adore that blue backdrop ! I absolutely love this look. Makes a big difference! Thanks for linking up to Mad Skills Monday! 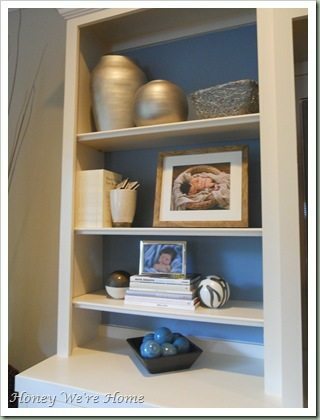 Your styling of the shelves looks great! 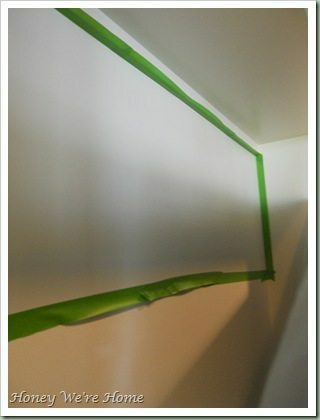 And, I LOVE LOVE LOVE frogtape. So worth the extra money. Turned out fabulously!!!! It has such an impact. I love the color you used. What a great idea! Nice job! The color looks fantastic! What a great, simple change. Love the difference one little can of paint can make! This looks beautiful. I love the splash of color. It's so pretty! That blue is perfect. Found your blog through Sunday Showcase. Wow! That looks stunning. The blue adds a lot of depth to your shelves. 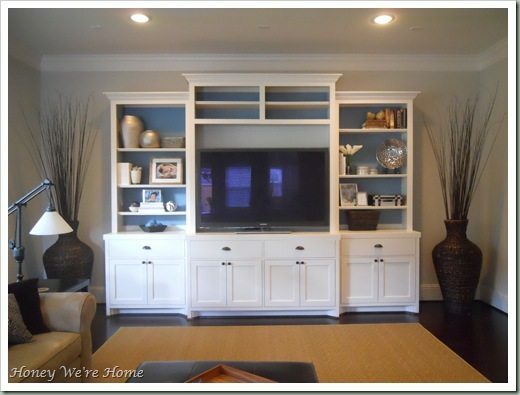 Lisa- Thanks for the compliment:) Our entertainment unit is built into the house- that way we could customize it to fit our living room. 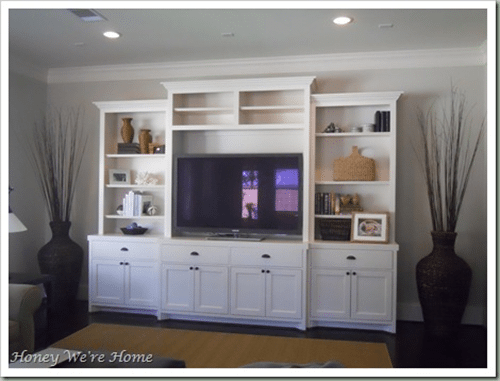 I know Pottery Barn has well-made entertainment centers, but they are pricey. Hi! LOVE your entertainment cabinet. Such an inspired idea to paint the back!!! I also LOVE the entertainment cabinet itself. I have been looking for just the right one for SO long. Yours is what I have been wanting. May I ask where you got it, and about how much you paid? 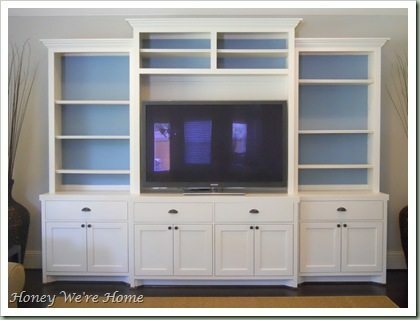 You started with an awesome media cabinet, and the blue makes it even prettier. Thanks for sharing. The blue really warms up the room! What a great choice and upgrade. 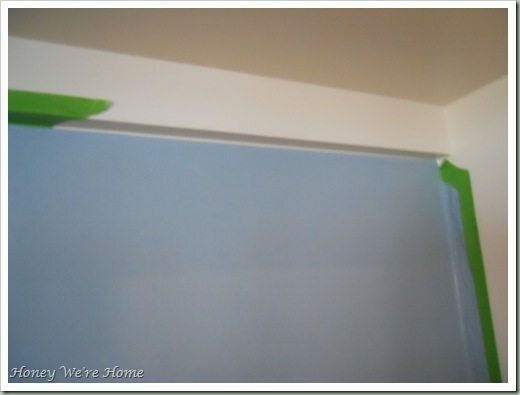 I heart frog tape! This turned out beautiful! 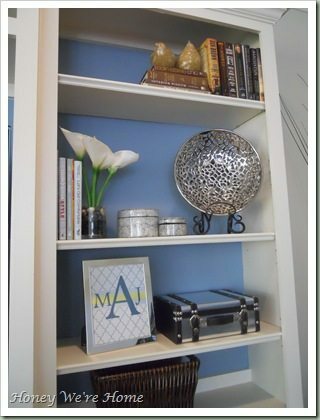 I love paint inside a bookshelf or unit like this it just makes everything pop, the blue was a perfect choice!! Great job! oh my…i came over from storiesofatoz and tracked this post down when i saw the snippet of blue in your cabinets!! I have a very neutral living room (a lot like your original living room reveal) and I'm thinking about adding some blue to it, too! I'm so glad I found this! I love it! 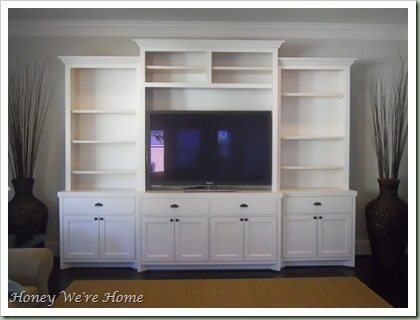 I saw your media cabinet on Pinterest and am in love! I'm thinking of building something similar for our upstairs living area. Your kitchen/family room layout is very similar to mine, so I'm going to do some serious note-taking! Beautiful home!